You can register and undertake the course for free and from the comfort of your own home (or anywhere else with internet access)…just sign up here! Are you a keen museum visitor? Lots of us are, and museums in the UK get millions of visits each year (over 100 million visits, according to the UK Museums Association). But perhaps you’d like to know a little bit more about what goes on. What are the issues that occupy museum staff? What is it to be or to run a museum in the 21st Century? As part of the MOOC you will hear from a range of academics and museum professionals about their roles, their research, the work they undertake and the issues they face in museums every day. You’ll also have your chance to tell us what the things are that you think museums should focus on in today’s society. Perhaps you are interested in finding out a little more about the subject of Museum Studies, or would like a taster of what we teach on our Museum Studies programmes? 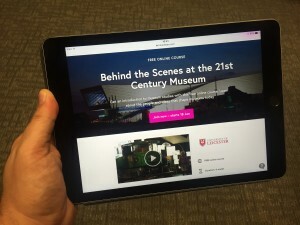 The MOOC will give you an insight into the issues that our students tackle from thinking about what it means to be a museum in the 21st Century, to thinking about how to better engage with audiences, exploring the ‘emotional museum’ and considering how a museum can tackle contemporary social issues. The MOOC is particularly designed to give you an insight into the issues covered by our Museums Studies programmes. If you are thinking about working in museums, this course will give you access not only to high quality research in the field of museums and museum studies, but also cutting edge examples of how this research plays out in practice. With the help of a large range of case studies from National Museums Liverpool, you will be able to consider a number of issues that museum professionals face on a daily basis, including how to work with different communities, the ethical conundrums faced by museum staff and how to best deal with difficult subjects in the museum. We’ll also give you some examples of the diverse range of roles that are undertaken by staff within the 21st Century museum. Perhaps you already work in museums and would like to bring yourself up-to-date with some of the latest research and thinking in museum studies and see some examples of current practice from one of the UK’s most innovative museum services? Lots of people have undertaken the MOOC as part of their continuing professional development. We’ll explore how museums are working in a range of fields including how museums can help address health and wellbeing issues, how they can tackle contemporary social problems such as racism and how they can represent marginalised communities such as the transgender community. We’ll also explore techniques for engaging with broader audiences and think about ethical issues faced by museum professionals. We’d also love to hear your thoughts an opinions and you’ll have lots of opportunities to talk to other museum professionals over the course of the MOOC. Are you keen to join in a conversation with professionals, academics and enthusiasts from around the world? Our MOOC covers a whole range of issues and includes, at every step, the chance to talk about these issues with your classmates and colleagues. The first time we ran the course, over 11,000 people signed up from over 100 countries and more than 40,000 contributions were posted! That’s a lot to keep on top of, but you can easily read just the most popular comments or follow people that you find particularly interesting. Taking the MOOC is a great way to make new contacts and debate contemporary thinking and practice in museums with a hugely diverse range of people who engage in museums in all sorts of different ways across the entire globe. You can sign up for the course absolutely free on the FutureLearn website. Whatever your reason for joining us for our MOOC, we look forward to hearing YOUR thoughts on the 21st Century Museum when the course begins again early next year. the last was worth time-spending… will this be a new range of topics? Hi Christian, glad to hear your enjoyed the course. This is just a re-run of the same course, so very little new content from us this time, but it’ll be a whole different set of people on the discussion boards of course! Best wishes, Rob.